The Disney Infinity launch has been pushed back to mid-August. The Big D's upstart challenger to the Skylanders franchise was originally slated for a June release. Like the incredibly successful Skylanders series, Disney Infinity will feature small action figures that come to life in-game when placed on a special peripheral, in this case called the "Infinity Base." Someone must have crunched the numbers and come to the conclusion that kids don't stay inside and play video games during the summer. Go figure. According to Disney Interactive's co-president, John Pleasants, the delay has nothing to do with technical issues. It's a marketing strategy: Disney wants the new toys in kids' backpacks by the time they get back to school in the fall. An August release will assure the figures still create that sense of new toy euphoria that drive kids (and some adults) insane with the mighty power of consumerism. If you were ever a kid, you know what I mean. Disney will most likely mimic Activisions' staggered release of the Skylanders figures to help maintain the buzz. For example, Skylanders Giants came out last October and people are still losing their minds and wallets to eBay as they try to collect them all. 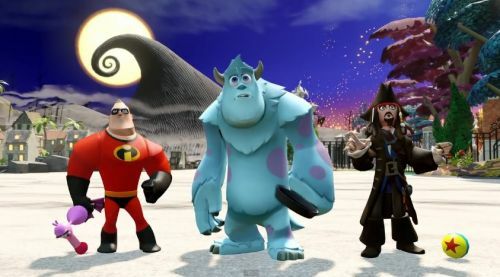 Disney Infinity will support two player local co-op and four player online co-op, giving it an edge over Skylanders, as far as cooperative features are concerned. Skylanders SWAP Force will most likely be out sometime this October, and the game will still be limited to local co-op, which is great if you have a couch buddy, not so much if you rely on online friends for co-op partners. Disney Infinity will hit store shelves on August 18th. You can catch the announcement trailer here or check out a good rundown of both games here. We all know they're eventually going to do this with Star Wars figures, right? Budget accordingly.